Great build quality and useful features make the WG-4 GPS a capable action camera that also performs well and usually produces attractive images. However, it's little more than a rebranded Pentax WG-3 GPS. If you're after a camera that'll survive some rough and tumble, the Ricoh WG-4 is built to shrug off plenty of abuse. It'll survive a 14-metre-deep dunk in the drink, a two-metre drop and -10-degree temperatures, plus it's crushproof to 100kg. Within this armoured exterior there's a 16.0-megapixel sensor and a 4x optical zoom lens. Full HD video recording and GPS location mapping are present too, and all for around £309.99/$329.95. Alternatively the WG-4 is also available without GPS for £279.99/$279.95, making it a well-priced rival to the likes of the Canon PowerShot D30, Nikon Coolpix AW120, Olympus Tough TG-3 and Panasonic Lumix FT5. The WG-4's toughness credentials really make it stand out. 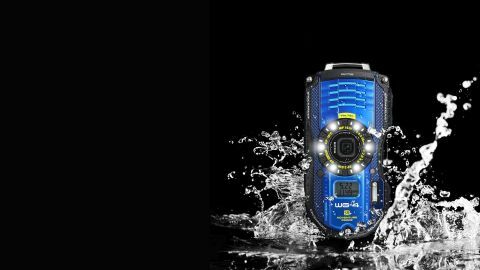 Its 14-metre waterproof rating falls short of the 25m-capable Canon D30 and the Nikon AW120's 18m rating, but neither of these cameras is built to survive the same 100kg crushing force that the WG-4 will withstand. The camera's 4x optical zoom lens has a focal length range of 25-100mm (in 35mm-camera terms) and will open to an f/2.0 aperture to help low light and fast action photography. Ricoh's Shake Reduction system is also present to help tame camera shake. Opt for the WG-4 GPS and its GPS system will record the coordinates at which your images were captured, allowing you to plot your travels when you get home. Image capture is taken care of by a 16.0MP, 1/2.3" CMOS sensor capable of a maximum ISO6400 sensitivity, with the results then displayed on a 3.0", 460k-dot screen. If all this sounds rather familiar, that's because the WG-4 is actually almost identical to last year's Pentax WG-3. Apart from being rebranded by parent company, Ricoh, the new camera gains a shutter priority mode, but loses the WG-3's wireless Qi charging ability. Build quality is especially important for a camera designed for extreme environments, and thankfully the WG-4's construction doesn't disappoint. Although the casing is primarily plastic it exudes solidity, and easily withstands multiple drops and bashes with barely a scratch. Double locks secure the door covering the battery, memory card and connection ports, preventing accidental opening when underwater. Considering this is an action-orientated camera, it's a pity there isn't much to grip on to. Those ridges on the front are mainly for show, and there's nowhere to rest your thumb either. Controls on the WG-4 are relatively large and well-spaced, with many also being textured. It all helps make them easy to use when underwater or while wearing gloves. Sealing the buttons against water intrusion has made them fairly stiff and spongey to operate, with the shutter release being especially difficult to press. It's a quirk that you soon get used to though, and in most other respects the camera is very easy to operate. The menu system is certainly showing its age design-wise, but it's simple to navigate and makes changing settings quick and easy. There are also nifty shooting overlays, like an electronic level to help keep horizons straight. The low, wide shape of the WG-4 means it gets a similarly-sized, widescreen-format screen. Sounds great, and it is when you're recording widescreen video. However for shooting stills in the default, squarer 4:3 format, you're left with wasted screen space on either side of an image preview that's really only around 2.5". The 460k-dot resolution is average for the class but nothing special, and the display brightness could also be better. Viewing angles are good though. Things improve at the front of the camera where six LEDs surround the lens. These illuminate close-up subjects which would otherwise be cast in the camera's shadow when using its 1cm macro mode. Hold down the green button on the rear of the camera and they can be manually activated to use as a torch. Finally, the WG-4 GPS also features a small, front-mounted LCD screen. It'll display the time, as well altitude and air pressure. It's also backlit for darker conditions and is a useful addition if you don't fancy taking your watch underwater.